Hamilton County has two tiers of public schools — a middle-class tier and high-poverty tier. What we have too few of are schools with a diverse student body — youngsters from middle-class, poor and even rich families. In our middle-class tier schools, it is no surprise that 63 percent of third-graders are reading at or above grade level, according to an analysis by UnifiEd, a local education advocacy group. For these children, the future is bright. But in the other schools — those with high concentrations of children from poor homes — fewer than 25 percent of third-graders are reading at their grade level. 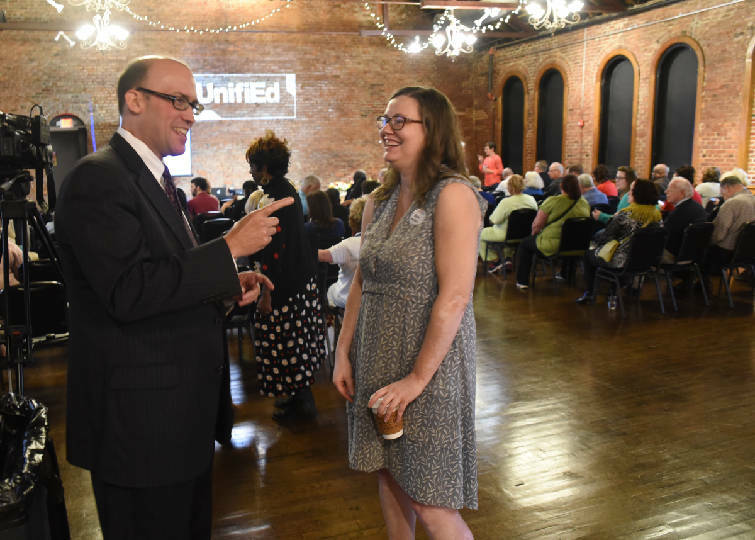 Richard Kahlenberg, left, talks with Elizabeth Crews, executive director of the local nonprofit UnifiEd, as the Church on Main fills with attendees Thursday. Kahlenberg spoke about reducing separate and unequal schooling in Hamilton County. Those are the county's high-poverty schools — schools where 80 percent or more students are eligible for free- or reduced-price lunches. One in three Hamilton County schools is high-poverty school. Worse, these are also schools where more than 40 percent of all teachers are in their first five years in the teaching profession. Isn't it clear that something is wrong with this picture? Of course — and that something wrong is our acceptance of this institutionalized class segregation. We in Hamilton County must change this very damaging dynamic, not just for the students, but for our county and our county's economy and future success. Noted education expert Richard D. Kahlenberg was in Chattanooga Thursday to speak to UnifiEd and other Chattanoogans about ways to rethink how we zone or invite economic integration in our schools. It need not involve busing. And because we already have one combined school system, it need not involve the movement of political constellations. What it will — and must — involve is creative theming or a renewed and genuine emphasis on magnet schools to bring improved energy, perceptions and reputations to our schools. Those improvements could be so profound as to move the parents who now send about 25 percent of the county's children to private schools to instead reinvest in our public schools. We know what we have now does not work. It's time for bold planning.